I have recently had a series of adventures in cylinder #1 but, in the process, have learned how to make a really good piston stop at home with nothing but a few hardware store parts and a 3/8" drill bit! I thought that maybe others would want to know. 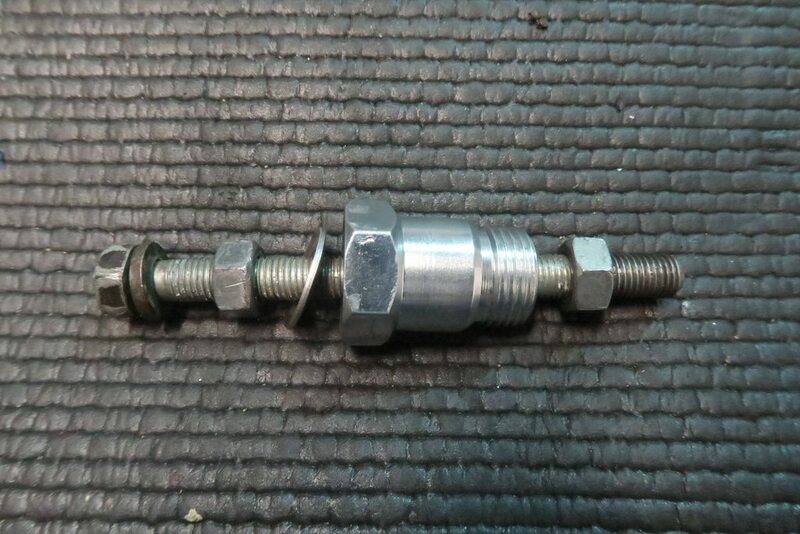 For the uninitiated: a piston stop can be screwed into the spark plug hole on cylinder #1 to help you find TDC. The general procedure is that you get the engine close to TDC, then screw this thing into the spark plug hole and screw the center part in until it is close to touching the piston (or touching the piston). Then you continue rotating the motor up (by hand!!) until it contacts the stop, and make a mark on the balancer where the timing pointer is pointing. Then you turn the motor in the reverse direction until you the piston bottoms out on the stop again, and make a mark on the balancer there. The average point between the two marks you made on the balancer is your true top dead center. Ok, so here goes - how to make a homemade piston stop! 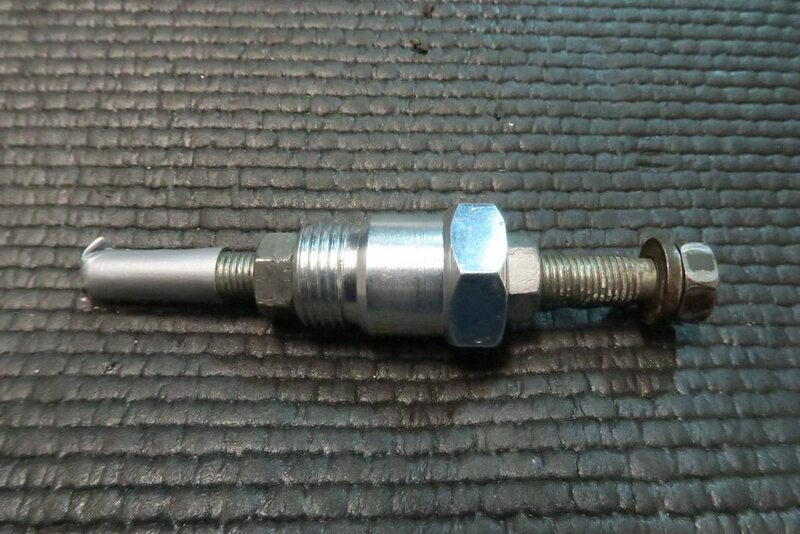 This is a handy trick to know if you find yourself in need of a piston stop but don't want to shell out $20 for a good one, or wait for shipping, or wait for the parts store to open, or whatever. Total cost: $5-8, depending on what parts you already have laying around in your shop. The non-fouler is $5. Now, I don't know what a "spark plug non-fouler" truly is or what it's supposed to do. 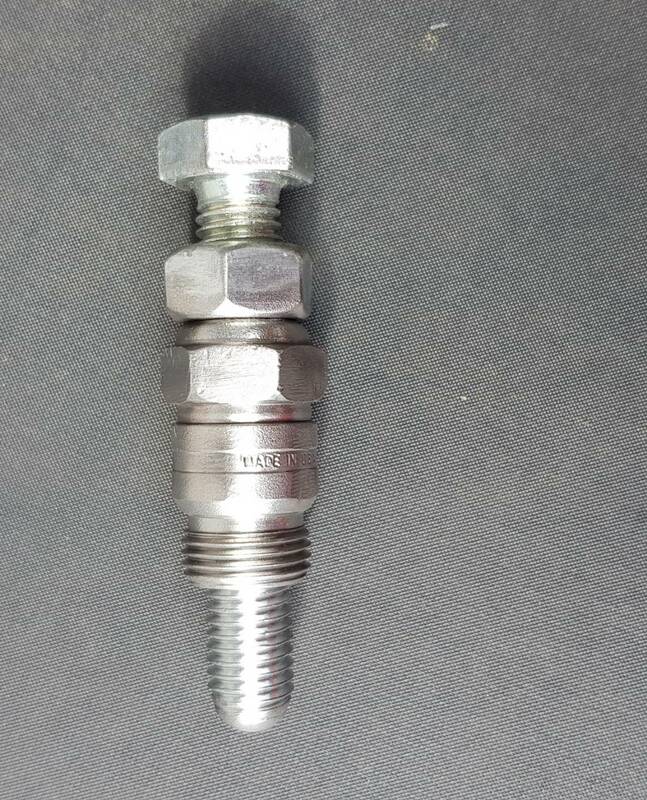 What I do know is that it's basically a spark plug but without the porcelain parts on either end. So it is ideal for making into a piston stop. So here we go: the instructions! Step 1: Drill the end of the non-fouler out with a 3/8" bit. 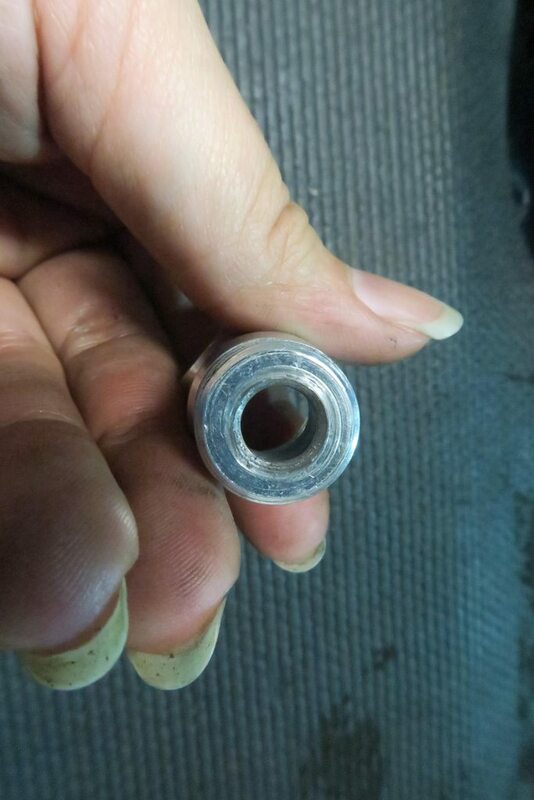 The hole in the end is just kind of small and you want a more robust bolt sticking out of it to avoid bending it with the piston. Drilling this out takes about 2 seconds. 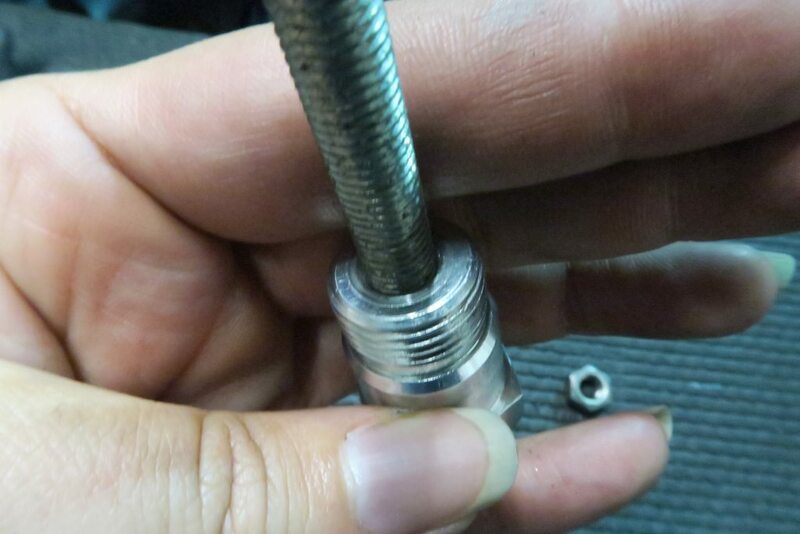 Step 3: Stick the non-fouler onto the bolt with the wide end facing the bolt head. It should slide right through but not be really loose. 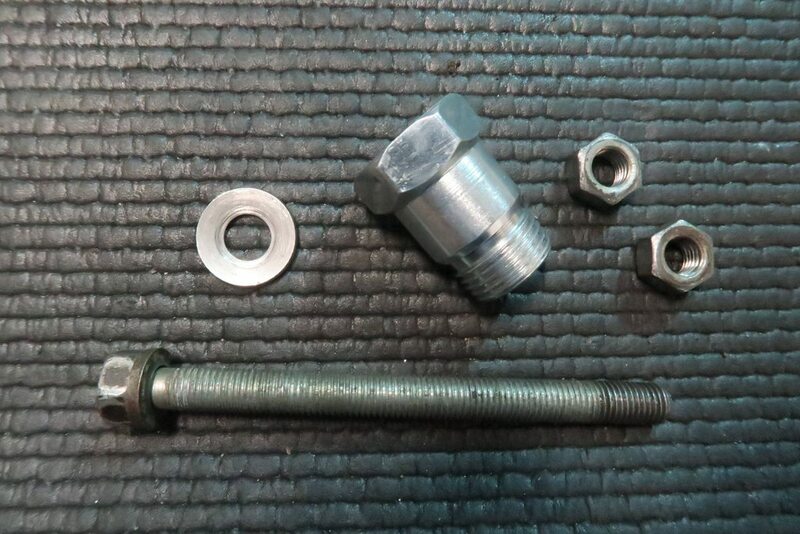 Step 4: Thread the second nut onto the end of the bolt and up the threads by about 0.5-1"
Step 5: Wrap the piece of duct tape around the end of the bolt to protect the piston against marring. Make sure it is really on there, not half-assed! And you're done! 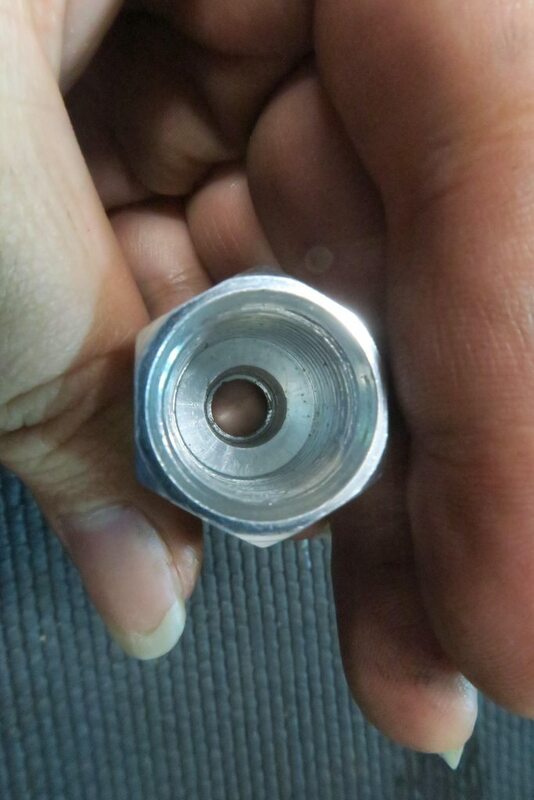 To adjust it to the correct length, I thread it into the spark plug hole, push the bolt down until it contacts the piston, then thread the nut/washer down onto the non-fouler. 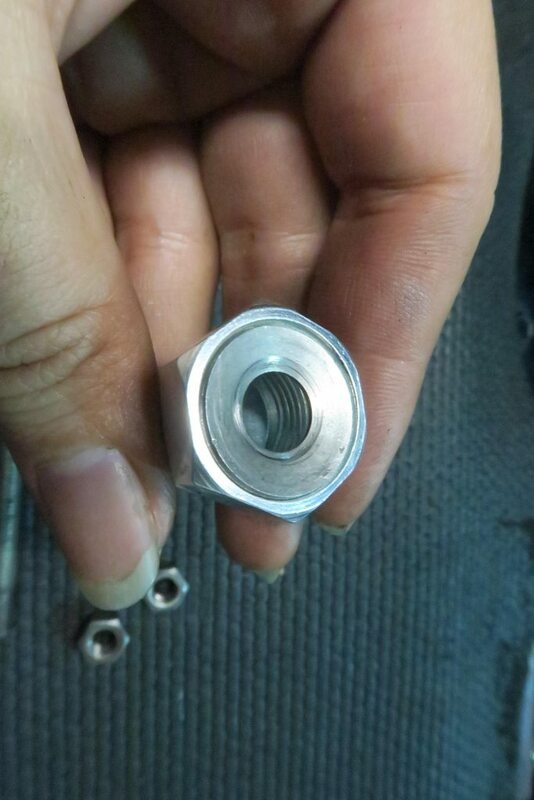 Then I remove it and tighten the nut on the other end to sandwich the non-fouler and bolt into place. Works awesome, it's easy peasy, it doesn't require you to weld or tap or cut or hammer anything. So, there you go. Kelly_H, subpar63, DonP and 3 others like this. I'm glad I didn't have to be the first to ask that. RIP Mallory, Abby, and Sadie. And now Casey. :-( We miss you girls. 79 Pinto Hatchback. Fully caged, 8inch 4:10 gears. 351W. Aftermarket Tremec T5 (1352 251), Going to be a fun cruiser. 72 Ranchero GT w/351Cleveland & automatic. Although this wasn't supposed to be a project car it seems that it has become one. Stupid rusted out California floor pans. Now, I don't know what a "spark plug non-fouler" truly is or what it's supposed to do. The non-foulers have been around since the Model T days. If you have an engine that is burning oil and constantly fouling the plugs you install the non-foulers to get the tip of the plug out of the combustion chamber and the oil. They're cheaper than replacing piston rings. Not pictured as it is in #1 cylinder. Nice work,,I like the use of a non-fouler!.. can be made with a regular old spark plug of course, by taking to the porcelain with a hammer (surprisingly difficult and messy - shards.. but it will come away eventually!).. rounding the bolt tip on the grinder is a good idea a also..
My first car had one on it when I bought it, to remedy bad valve seals. I haven't seen one since 1967. I thought this was something that you put into the piston to make it stop going up and down, but I couldn't understand why you wanted to make it stop. I thought you were a Paleontologist!! I just happen to have a couple spark plug non foulers sitting in a bin for decades. Driving a stock Mustang is like driving a sofa. I'm Real Good at driving sofas! Yup made mine back in 1974. DrHawkeye and watto1 like this.